Comodo Internet Security, Comodo’s award-winning free security suite, offers prevention-based, Default Deny Protection (DDP) technology to prevent malware in your PC. Conventional security suites ignore prevention, focusing only on the eventual detection of viruses. Basically, this means that it will allow all applications to access your PC resources by default as long as the application is not on your security software’s blacklist of already known malware. 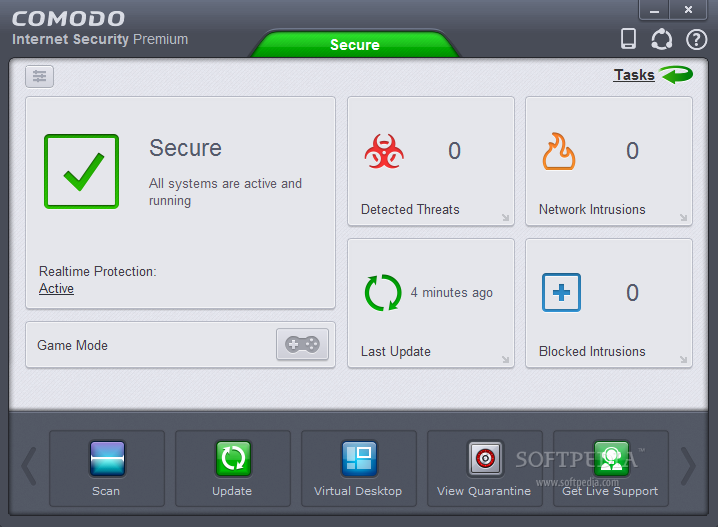 Comodo Internet Security includes an extensive white-list of safe executables called the 'Comodo Safe-List Database'. This database checks the integrity of every file and application asking for access to your PC. In addition, this software can alert you of all potentially damaging programs even before they are installed. This is a ground-breaking method of protecting your PC. Traditionally firewalls only detect harmful applications from a blacklist of known malware - often-missing new forms of malware that are being created and launched daily. Comodo Internet Security is continually updated and currently almost 3,000,000 applications are in Comodo Safe list, representing virtually one of the largest safe lists within the security industry. Put simply, the good stuff gets in, and the bad stuff gets nowhere near your PC’s insides. Our latest version includes both DNS protection, to make sure the URLs you visit are safe, and the option oh installing the HopSurf toolbar, a new and innovative way to surf the Web. Comodo Internet Security is now available in 15 different languages, and comes included with a free 30 day trial of Live PC Support. · V581 fixes issue where users stuck on a base and were not able to update further. We resumed updates for few hours today and then paused. Hopefully from tomorrow we will be able to resume without pause. Its a really good and effective security ! !